Fine seaside tavern and a welcome sight on a hot day. As the previous poster mentioned they serve a decent pint of Directors. The sea food stall out front is very nice too. I like this pub, its old and its what you would expect from a seaside pub. In the summer its absolutely manic and it can be hard to get served but sitting in the beer garden with a cold beer is wonderful. The beer is decent, I am a real ale drinker and they had a very nice pint of Directors on hand pull and another special real ale which I can't remember. They have the normal array of Stella, Becks, Fosters lagers. They have a pull table and dart board but I have been in there when they had a darts night and it can get pretty nosey but adds to the atmosphere. They show sports on TV so you can watch your football if you wish and a restaurant out the back. Food is good, portions are huge, a Sunday Roast and a Pint of beer and I was ready for bed. 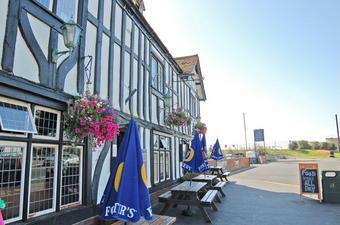 It's nice to know that this is still a traditional British seaside pub and not another Harvester!